This guide does not qualify as legal advice, and should not be taken as superseding the requirements expressed in any license agreements that the Institute may have with rights organisations or publishers. Whilst we have endeavoured to ensure the accuracy of the statements in these guidelines, responsibility for the consequences of any action, or lack of action, taken by a reader as a result of reading these guidelines remains with the reader concerned. The information and images on this guide are from the JISC Web 2.0 Rights Website (Design Credit Andreas Viklund) and licensed under a Creative Commons Attribution-Noncommercial 2.0 UK: England & Wales. Intellectual Property (IP) lets people own the work they create. IP results from the expression of an idea. So IP might be a brand, an invention, a design, a song or another intellectual creation. IP can be owned, bought and sold. This guide provides an introduction to Intellectual Property Rights (IPR). IPR is a complex subject and students and staff are advised to seek further guidance using the links provided on the different pages. To find out which right is most appropriate, click here. Performers rights' issues arise in any type of performance (theatrical, musical, oral, dance or even in a lecture). Permission to reproduce is imperative in order to avoid infringing copyrights. Patents protect the features and processes that make things work and lets inventors profit from their inventions. Patents last for a maximum of 20 years from the date of application. Information on patents is available from the UK IP Office. Trade Marks can be registered or unregistered and a trade mark is typically a symbol, image or word associated with particular goods or services. A registered trademark must be renewed every 10 years to keep it in force. 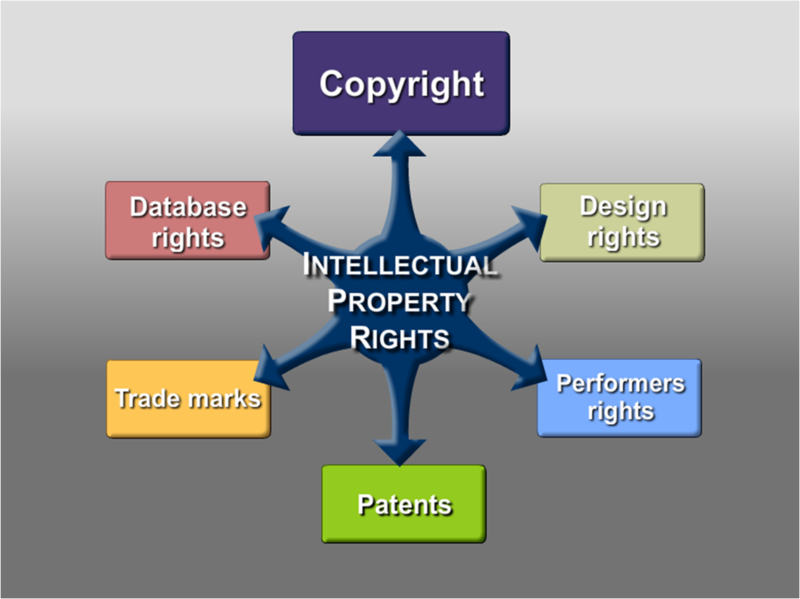 Database rights is in addition to the underlying copyright of the contents of the database. A database is a collection of independent works, data or other materials that are arranged in a systematic manner. Database rights alone can be as long as 15 years from publication date. Copyright User is an independent online resource aimed at making UK Copyright Law accessible to creators and members of the public. The goal is to provide answers to the most pressing concerns creators have about copyright, helping them understand their rights.